The release brings some exciting new features and enhancements, scroll down to learn more. General Options - added more help around the options. Campaign Settings - improved look and feel along with more help. Sync Settings - better reporting around Salesforce storage. 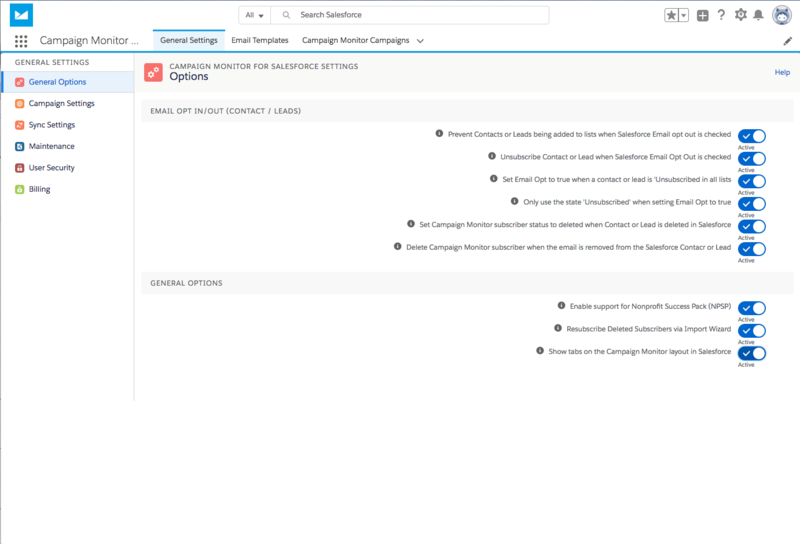 Maintenance Settings - improved messages section, better management when resetting the data synced between Salesforce and Campaign Monitor. For existing users, the old Salesforce tabs will point to the new location. You can optionally delete the old Salesforce tabs (i.e. Sync Settings, Tracking Data, Advanced Settings, Billing and Campaign Settings). We have overhauled billing to make it easier to edit contact details, see a history of invoices, resend past invoices and update card details. You can now automatically create and link a Salesforce campaign with a Campaign Monitor campaign. When the system detects a new Campaign Monitor campaign it will automatically create a corresponding Salesforce campaign and link the two together. The new Salesforce campaign will be populated with all the campaign members that were found in the Campaign Monitor campaign (assuming the members exists as Salesforce contacts or leads). Salesforce Campaigns will be created when the main sync runs. 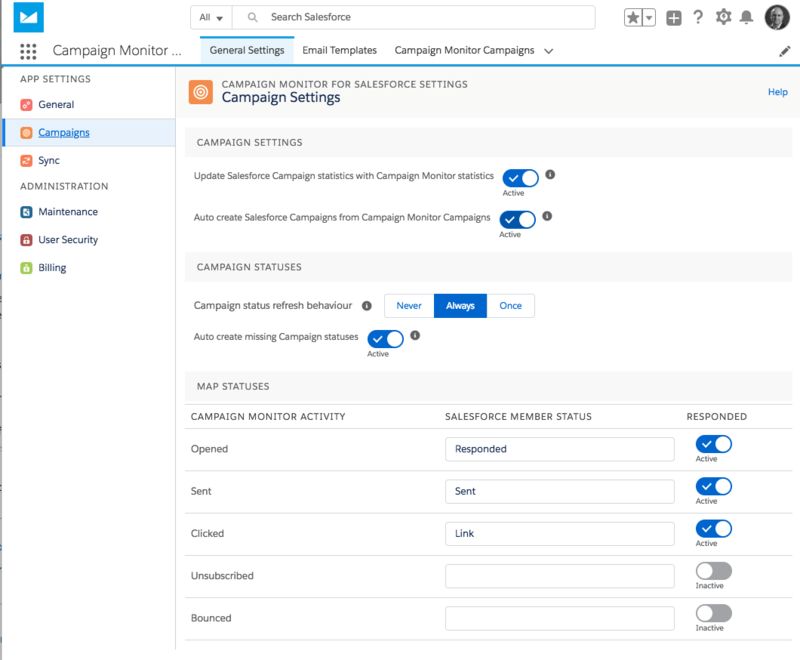 This is not retrospective - only Campaign Monitor Campaigns created after the date this setting is enabled will result in Salesforce Campaigns being created. A new setup wizard has been introduced to help installing Campaign Monitor for Salesforce. This simplifies and improves the connection process to Campaign Monitor. The setup wizard will now automatically setup page layouts and enable the sync. You can choose not to automatically enable these steps by pressing Cancel. The steps can be manually completed by via the new Sync Settings screen. If you would like to automatically receive these release notes by email, use the sign-up form below.